Okay, over the past few days, something quite amazing has been happening! One day, my little brother (who is 11 at the time of typing this) decided to come to my room, as he was bored, and then asked me if he could play my GBA. I told him he could, and then we went digging for Game Boy games to see which one he would want to play, and then we found Pokemon Red and Blue, he started playing Red, and kept playing it for what seemed like hours, and he never seem to get bored, however, the GBA he was using wasn’t my good one (which was lost at the time), and he said it kept freezing and turning off on him randomly, I have never never experienced it myself, and neither did anyone else I know, but I took his word for it. So I decided to hook up the N64 and pop in Pokemon Stadium, and the GB Transfer Pack, so he could play on the TV instead, and he was playing it for a good long while then as well, he never got far, but he caught quite a few Pokemon, and also eventually won the 1st badge, and caught a Pikachu. He mentioned throughout that he was jealous that I grew up in that era, and he was born after it. He said Games, TV shows, Wrestling and such like were better back then. I thought so as well, but I always thought it was simply my nostalgia telling me that, and I may look back at this era the same way in 10 or 20 years time, much like I did with the DC/PS2/GCN/Xbox era. However, I am now starting to believe that maybe it might be more than Nostalgia after all. My brother even wanted to have one of my PSones and some games, so I complied, and he seemed to keep playing that over his PS4! Maybe that time, it was simply a new thing to him, and maybe he’ll go back to the PS4, only time will tell, I suppose. For those who haven’t read this blog before, or have only read it recently, we go to our grans for lunch with our cousins every Sunday, and one week, my brother played my GBA there, and my other, littl-er(?) brother saw him, and got jealous, as he had nothing to play, so after we headed home, I gave him my other GBA and Pokemon Blue, and just like with my other brother, he got hooked, and won’t stop playing it. Nowadays, I’m always being interupted (from playing and makinggames, obviously… what did you think I meant?) by one of my brothers asking me to have a shot of Pokemon Red or Blue (depending on the brother) and I never hear the end of them talking about what Pokemon they caught and what levels they are, etc. etc. I have no idea what is with the quality, it was taken with a camera on a brand new phone! 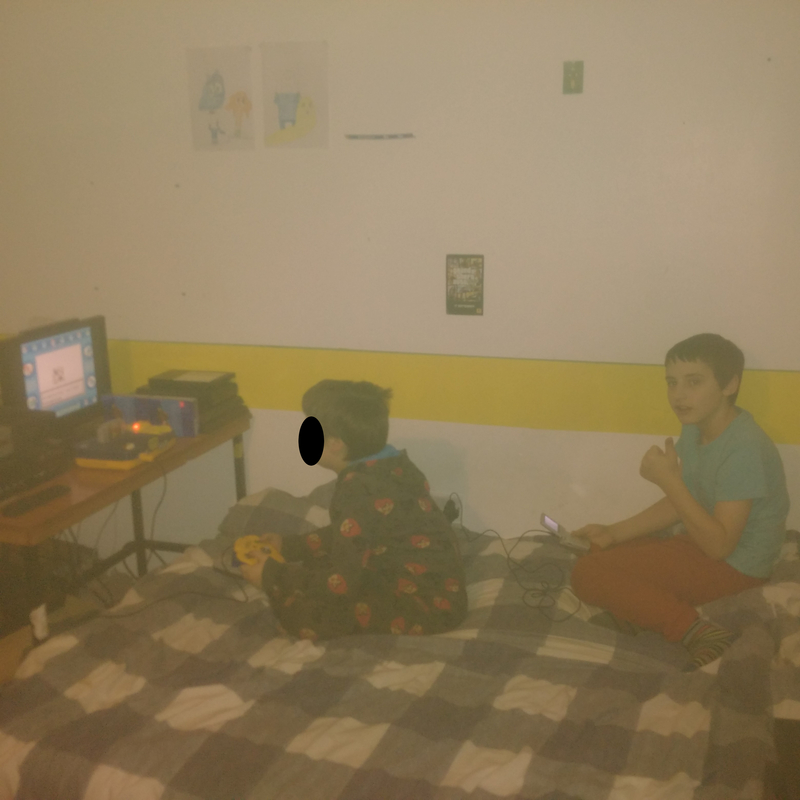 Christmas soon came, though, and my smallest brother (left) has taken a break from Pokemon for a while, and is busy with Destiny and Little Big Planet 3, but the other is still playing it, even as I type this article! It was amazing seeing them into an old game I never thought they’d get into, it was amazing seeing them experience Pokemon games as I did as a child, without the aid of guides or any prior knowledge of what was in the game, so everything was new to them!